New Haven Corporation Counsel John Rose Jr. and Mohit Agrawal. The following is an entry in our political theater series. 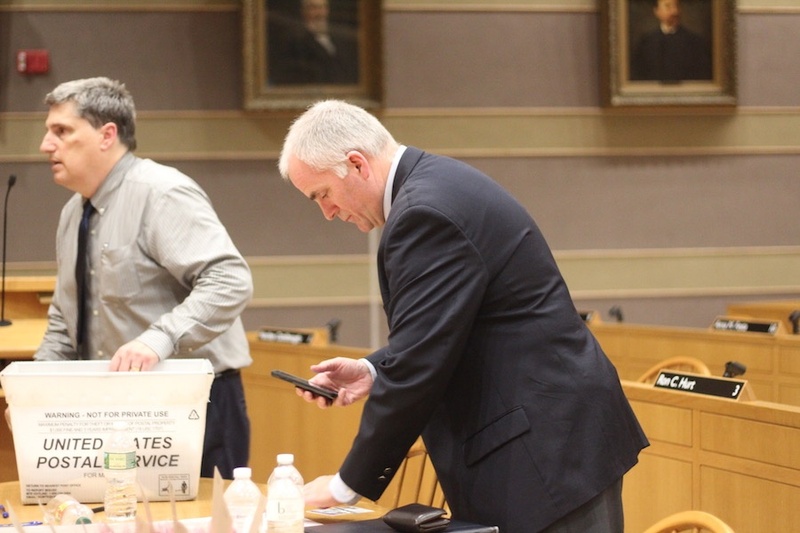 To read more in-depth reporting from Tuesday night’s scene at City Hall and around New Haven Generally, check out coverage from Paul Bass, Markeshia Ricks and Christopher Peak in the New Haven Independent and our Vox Populi on voter participation. A middle-aged white guy stands at center stage, holding a cell phone like an offering over his head. He turns on the camera app, focuses in on a young Muslim woman just a few feet away from him. On the phone’s screen, her brown skin and pink hijab shift into focus. He clicks the automatic shutter button, brings his phone back down and jots down another line to a running tally. She averts her eyes and elbows a friend. Is it voter intimidation? Or is it within his right in a public gathering place? And what led to this moment anyway? 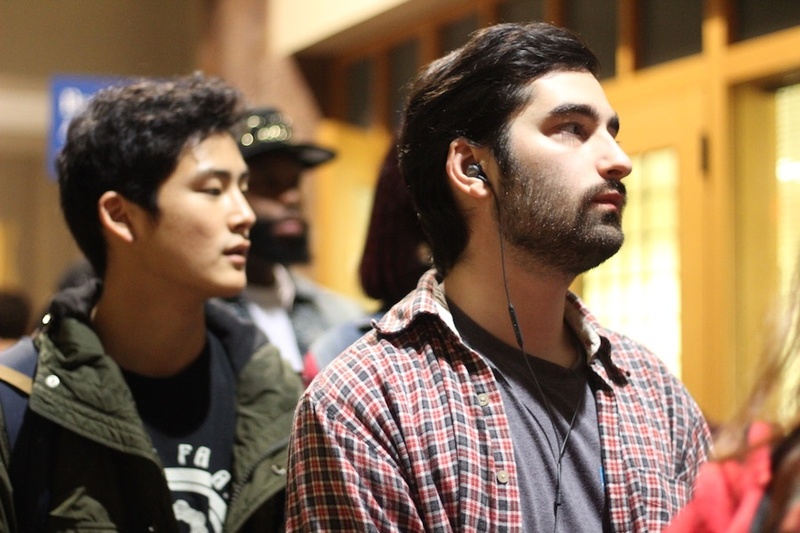 Those questions were at the core of Tuesday’s Injunction Junction, What’s Your Function?, a one-night-only performance at New Haven’s City Hall. Billed as participatory democracy with a side of dinner theatre and voter suppression, the play followed hundreds of concerned citizens as they raced to register and vote before polls closed at 8 p.m. Per a warning on the building’s doors, not all who entered left with what they wanted. While an encore titled We’re Not Gonna Take It (Your Right To Vote, That Is) was scheduled for Friday in Hartford, no one seemed to care about it after Tuesday morning, as Ned Lamont was declared governor-elect of Connecticut. Lamont’s starring role in Really, I’m Not Dan Malloy! begins in January. Co-written by an increasingly sore Connecticut GOP, New Haven’s Registrar of Voters, exhausted and overworked New Haveners, and hundreds of Yale students who never received their absentee ballots, Injunction Junction tells the story of 75 intrepid citizens who start the day confident they’ll be able to vote, and end it not knowing if their voices have counted. Hundreds more join them in a kind of Greek chorus, nibbling pizza and stuffing brisket sliders into their mouths as the evening lurches toward 8 p.m. They all play, irrefutably, themselves: single moms holding down two and three jobs, newly-minted American citizens, 20-year-olds who never registered when they turned 18. And they have all come together for the same reason: to register and cast their ballots on Election Day, an option that Connecticut has offered since 2012. Some are particularly winsome, like 26-year-old Deniqua Washington, a Virginia transplant who declares “this is a make or break time for our state!” just as the clock hits 7:51 p.m. Or proud mom Peaches McFadden, who vows to wait for her first-time-voter daughter Magique Brown for as long as it takes—which is ultimately over three hours. The snag is, no one there seems to have prepared adequately for their arrival, despite the fact that the’ve done it before. Multiple times before. Registrar of Voters Shannel Evans—bravely playing herself—and a small army of city employees and volunteers are soon overwhelmed with demand. As in Evans’ previous works What The Hell Is Same-Day Registration (Nov. 4 2014) and Oops We Did It Again (Nov. 8 2016), the sprawling theater becomes chaos the longer the play lasts. In the evening’s most confounding number, several members of the chorus come together to attest that they are first-time voters, raising their right hands en masse and then heading to a separate area, taking time-stamped, cell phone photos of their registration sheets as they file into a line. Like Tarell Alvin McCraney’s Marcus; Or the Secret of Sweet, the play both adheres to harrowing realism and is the third installment in a trilogy, pulsing with the sense that we’ve been here before and may end here again. There are glimmers of light: law students who cut through the noise to deliver big performances, and bright-eyed volunteers from around the city who flood in when the going gets tough. There’s City Hall superstar Al Lucas, cracking jokes even as he goes on hour 15 of an 18-hour day. And genial moderator Kevin Arnold as himself, delivering zingers like “this was a dress rehearsal for the next presidential election” to the news media by the end of the night. But more visible are the play’s supervillains, who file an injunction on those first-time, post-8 p.m. voters, seeking to render their votes obsolete. It’s a moment of rare clarity in a muddled campaign season that pulls back the curtain on Republican gubernatorial candidate Bob Stefanowski, who has also sent “challengers” into the city monitor voting for much of the day. The night is still young. He’s going to fight this out to the bitter end. Or, his team is. 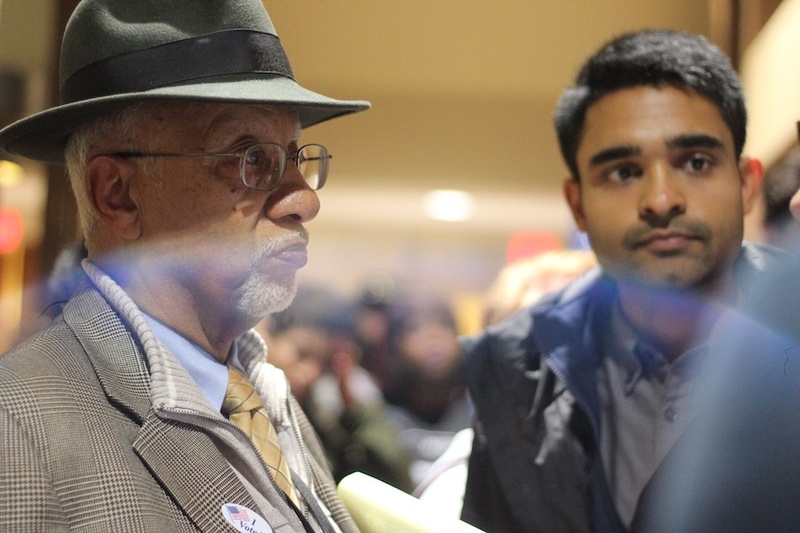 At the center of the Aldermanic Chambers stands divorce attorney Tad Bistor as himself, taking a close up of every single voter in line to vote after 8 p.m. On the fringes of the room, Republican attorneys Chris Oliveria and and Mark Shiffrin fret and fume, phones at their ears every few minutes. Every so often they glare at their Democratic counterparts, who stake out the room’s left wall and glower back. And yet, it’s with their arrival that Injunction Junction’s complexity is strongest, and most heartbreaking. On one hand, these challengers embody the makings of a police state, where every civic move is scrutinized, every step forward called into question. But on the other, they are a check on an out-of-hand balance—the failure of a city to do right by its citizens in an election year that was projected to be hectic. Reviews of Injunction Junction have not been good. During the show, the chorus’ own cry of “Let Us Vote! Let Us Vote!” suggested that things were out of hand. Dan Barrett, legal director of the American Civil Liberties Union (ACLU) of Connecticut and one of the play’s earliest critics, issued the following statement before the performance had even ended for the night. As of Tuesday night and into Wednesday, future performances and adaptations of the play remained uncertain. Those experiencing Injunction Junction fear of missing out (FOMO) were encouraged to check out satellite performances of The Rain Ate My Ballot in New Haven’s Westville and East Rock neighborhoods, which ran well past midnight.